KAMGAR Kesari Rambhau Ruikar Pratishthan observed the 65th death anniversary of Rambhau Ruikar. 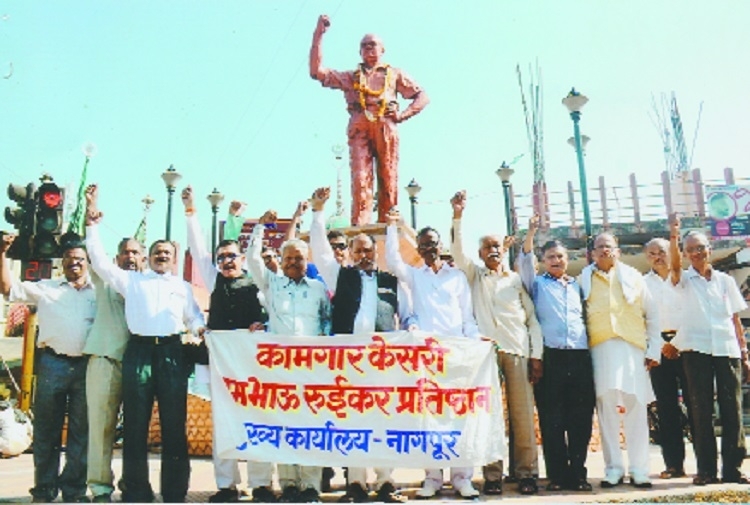 Members of the organisation gathered near the statue of Kamgar Kesari Rambhau Ruikar near Chitnis Park, Mahal and paid tribute to the renowned workers leader by garlanding him. The event was held under the leadership of President of the organisation Mukund Muley. General Secretary of Central Employees Federation, New Delhi - N S Pillai was the chief guest on the occasion. While addressing to the gathering Muley said, “Ruikar was a great workers’ leader of his time and had very close relations with Netaji Subash Chandra Bose. Both had worked together for the first workers union under the British rule Akhil Bhartiya Kamgar Sanghatana,” he said adding that Ruikar had motivated workers to take active part in the 1942 freedom movement. Muley also added that Ruikar was also offered the post of Chief Minister of CP and Bearer State by then Union Home Minister Sardar Vallabhbhai Patel. But Ruikar refused the offer as he was happy serving the cause of labours. In his address Pillai spoke about Ruikar who had to spend several years in prison during the freedom movement. Ruikar had also worked with and was associated with V V Giri and other leaders of the country. Those who paid tributes to the leaders were Arvind Jaiswal, Pratapsingh Chauhan, Tukaram Dekate, Ujen Josheph, Raju Sonkusre, Rajesh Mishra, Nagesh Dande, Anandrao Badke, Hiraman Hingnekar, Pandhari Gunjewar, Rajesh Mishra, Pradeep Lambe, Prakash Sahastrabudhe, Dr M Vachnekar, A Gundalwar and others in large numbers.